brianv wrote: It has to be fake, so much scum in one place would spontaneously combust! LightCone wrote: Are you referring to the shadow from his left arm? Admittedly, the "left hand" portion of the shadow doesn't seem to correlate. 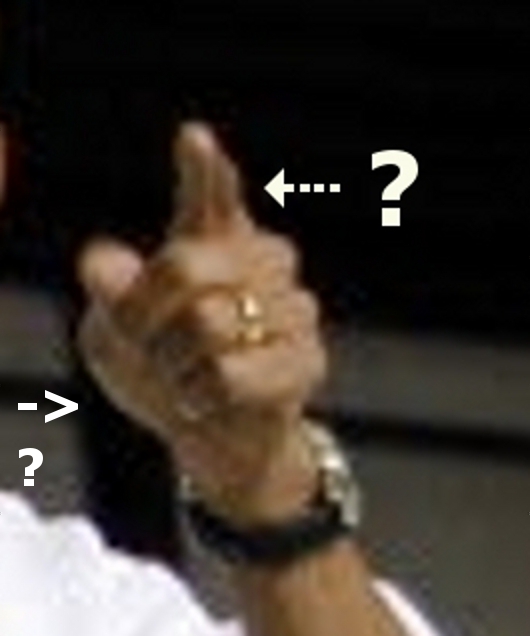 Does Obama's forefinger seem to correlate with reality? As far as I know, most people have only ONE forefinger. Not two ! I know. The shadows are all wrong. There are a few small ones but they are inconsistent. It's a very fake photo. It's also got me wondering now: Is there really an Airforce One aircraft or is that bogus too? I guess they have no reason to have one anymore since they can just fake photos of his "trips." Split in the wedding ring! His manicurist needs firing! The longer I stare at it, the more absurd it becomes! Kevin Lamarque that says he took above pictures at Kabul (or whatever!) is a friend of Hillary - http://blogs.reuters.com/kevin-lamarque/ and he is just a … journalist. Obama's magical see through leg! 5/02/2012 President Obama flew to Bagram, Afghanistan to talk about the war strategy and planned withdrawal of troops marking the 1-yr anniversary of Osama Bin Laden's raid and killing. Clearly they staged Obama coming out from behind the truck to impart the fact that it was real. The chroma key was off and his leg disappeared into the background. Also watch as he emerges from the truck, his right arm (on our left) is heavily pixelated as it "renders". Re: Obama's magical see through leg! I'm not going to give the video a hit and it's probably riddled with advertising, f*ck google and youtube. He looks decidedly CGI here!! Have they rolled out a new Ob[jectOriented]ama SIMTRON, was he ever real? whoops typo, I have spellcheker enabled but it doesn't catch my typing anywhere!? Last edited by brianv on Thu May 03, 2012 10:29 pm, edited 1 time in total. Politics is indeed becoming "digitized", literally. It's only reasonable: why have a physical puppet when you can have a digital puppet? Though, is some motion capture from a physical person still required, or have they already moved into completely CGI-from-the-ground-up - characters? Of course, as their templates get more sophisticated and comprehensive in quality and quantity, physical puppets will be made increasingly redundant. Digitizing of anything/everything is a worldwide trend elsewhere in life, too, so they're "just" doing their part. Last edited by Makkonen on Fri May 04, 2012 7:44 am, edited 1 time in total. I played with the exposure levels and while I know this isn't scientific it helps clearly illustrate the gap in his leg. There's a quite interesting multiple-shadow play as the Obama figure enters the stage. Ok, one may assume he casts several shadows due to a 'crossfire' of spotlights illuminating the scene. However, one would expect this multiple shadowing to be noticeable in other objects present in this shot - not only on the walking/wagging Obama figure itself. And - is it only me, or does the shadow to his left (seen on pavement at bottom right of the frame) seem to speed up - and 'overtake' him? Obama's lip synch seems to be off now and then, in the sense that some words he utters do not seem to jive with his mouth shape. Also, those dimples around his nose and mouth are odd. They're reddish and look more like (bleeding) scars, flickering back and forth as he speaks. Are they meant to be face shadows? Strangely enough --there are more oddities! At approx 02:19 - 02:20 right at the time Obama says the word "launched" a "white ball" is launched in background where he emerged from! Then, from 02:21 -02:22, it continues to "bounce" around, even into the grill of the truck where it should ever be seen. Obviously some weird masking layers gone wrong? I have no idea how to even describe what this was supposed to represent? Seriously, I will do some screen captures but this really needs to be seen in the youtube video to get the full effect of it's weirdness. Now don't get me wrong, I understand this was filmed "live" in a hanger and birds fly in those types of places all the time. Here's the thing...I've worked in production...if there is a bird...you get rid of it. That may simply mean opening the door and "shooing" it out or something more elaborate. But the entire point of shooting in a studio is to have a "controlled environment". However at 10:17-10:18 a white bird -- subconsciously registered as a dove = peace flies by, right as Obama is talking peace. It appears again late in the video but I didn't mark the timecode. 1) Obama's right palm (on our left of the screen) crosses over onto the grill of the vehicle. The colors of his palm blend with the color of the front of the vehicle and so we get rendering artifacts. 2) The play between Obama's hands and when they are visible behind the "microphone stand" layer. There is a lot of weirdness in this area and should be fun to explore. Is it just me or do Obama/s hands remind you of the Swedish Chef fro the muppets? Game_Over wrote: Strangely enough --there are more oddities! Thank you for being so far ahead in putting together the GIF SOUP animation of what I described! I am going to get familiar with how to do that this weekend. It is incredible to watch this video EYES WIDE SHUT! This is so relevant because it is current! And it is not 9-11 related so even those who give 2 sh!ts about the "truth movement" can show this and simply ask people to explain it. This can be shown in a non partisan way and just simply ask people to explain how this is possible? It's kind of funny to watch them wriggle their way out of defending this. I am sure on a more thorough analysis of this video we are going to find at least 10 more examples of media fakery in this one video. With Obama's magical see through leg as number 1, I will personally try to find number 2 with my limited skill at this type of thing.